TEMPE, AZ--(Marketwire - May 1, 2008) - The Dow Chemical Company was selected as winner of the "Best of the Best" 2008 ESS Excellence Award for leveraging innovative information technology to eliminate more than $2 million in redundant legacy reporting systems and achieve greater efficiency and accuracy by enabling all of its U.S. facilities to use a common environmental reporting process. ESS, the leading provider of Environmental, Health, Safety (EH&S) and Crisis Management software for enterprise sustainability and sponsor of the award program, announced the 2008 winners. Dow was honored for its landmark Environmental Reporting Project -- the largest emissions management program of its kind and a powerful example of results that can be achieved by expert managers who unify and streamline information processes enterprise-wide using ESS software. A joint Dow EH&S, Dow IS, CH2M Hill and ESS team was assembled to implement the system company-wide. Upon completion, Dow's new work process and unified software platform eliminated over $2 million in legacy systems and leveraged other existing enterprise information systems through interoperability with the ESS software. The new unified platform allows all of Dow's 200 U.S. facilities to use a common reporting process and has the potential to save an additional $2 million over time on elimination of redundant work processes and supporting resources. The ESS Excellence Awards, co-sponsored by BNP Media's Pollution Engineering and Industrial Safety & Hygiene News magazines, are selected by a panel of independent judges to recognize extraordinary achievements in the use of advanced information technology to enable business sustainability and performance. Launched in 2006, the Awards attracted a record number of success stories in 2008. Hundreds of organizations around the world inquired to see if their stories might qualify. "The number and variety of organizations that applied -- ranging from petrochemical, manufacturing, transportation and other industries to government agencies, universities and public utilities -- proves that EH&S and Crisis Management are now business imperatives. Organizations everywhere need to address critical EH&S issues in order to reduce operational complexities, risks and costs and achieve their sustainability goals. This also enables organizations like Dow to make better decisions, enhance planning and take a more holistic view from the plant level to senior management," said Robert Johnson, ESS President and CEO. 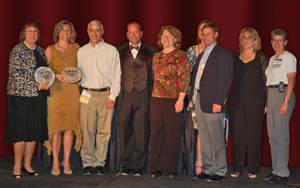 Dow was one of 31 organizations that received 2008 ESS Excellence Awards. Other winners are Alcoa; Andrews Air Force Base; Beale Air Force Base; Brookhaven National Laboratory; Campbell Soup Company, Napoleon, Ohio; Cardinal Glass Industries; City of Columbus, Ga.; Delta Air Lines; Duke Energy; Gilbert (AZ) Fire Department; HD Supply; Illinois Auto Electric Company; JR Simplot; Kocsis Consulting Group; Koppers; Kroy Building Products; Lyondell Chemical Company; Maryland State Highway Administration; Metropolitan Government of Nashville (TN); New Jersey Natural Gas Company; PetroChina Company Limited; Purdue University; Raleigh Parks & Recreation Department; Sanitation District No. 1 of Northern Kentucky; Seagate Technology; Sea Ray Boats; St. Petersburg (FL) Police Department; Sumner County (TN) Government; Tempe (AZ) Fire Department; USDA Forest Service; and Vought Aircraft Industries. ESS is the leading provider of Environmental, Health & Safety (EH&S) and Crisis Management sustainability software that supports Governance, Risk and Compliance and operational excellence. The company has provided global and local software solutions for thousands of businesses, government agencies and other organizations worldwide. ESS is headquartered in Tempe, Ariz., with major U.S. offices in Denver, Houston, Washington, D.C., and international offices in Beijing, China and Calgary, Alberta.